For as long as I can remember I have been using Sally Hansen’s Nail Care products. The brand is a household name and a favourite of mine because their products are modern, innovative and affordable but most importantly they really work! Today I will be highlighting three pretty in pink products: Pampered In Pink Color Therapy, Back to the Fuchsia Complete Salon Manicure, and the Strengthening Nail Polish Remover. This stunning vivid pink shade is formulated with the added benefit of argan oil to moisturise, nourish and improve dry brittle nails. The colour is vibrant and my nails feel stronger and look shinier, I am also very impressed by how quick it dries. The wide brush makes application very easy, there is no need for a base or top coat and the colour lasts for over a week without chipping or fading. I can’t wait to get a few more colours from this range. Available in 13 shades. Introducing new Color Therapy™, gorgeous color that cares while you wear! The patented argan oil formula fuses intensive nourishment and instant moisture for healthy-looking nails. Up to 10 days of fade-proof, chip-resistant wear. The Complete Salon Manicure collection encompasses 7 benefits in 1 bottle. The brush is fantastic, it’s easy to apply and my manicure stays fresh for at least 7 days. I love this all in one formula which feels light on my nails and helps keep them long and healthy. 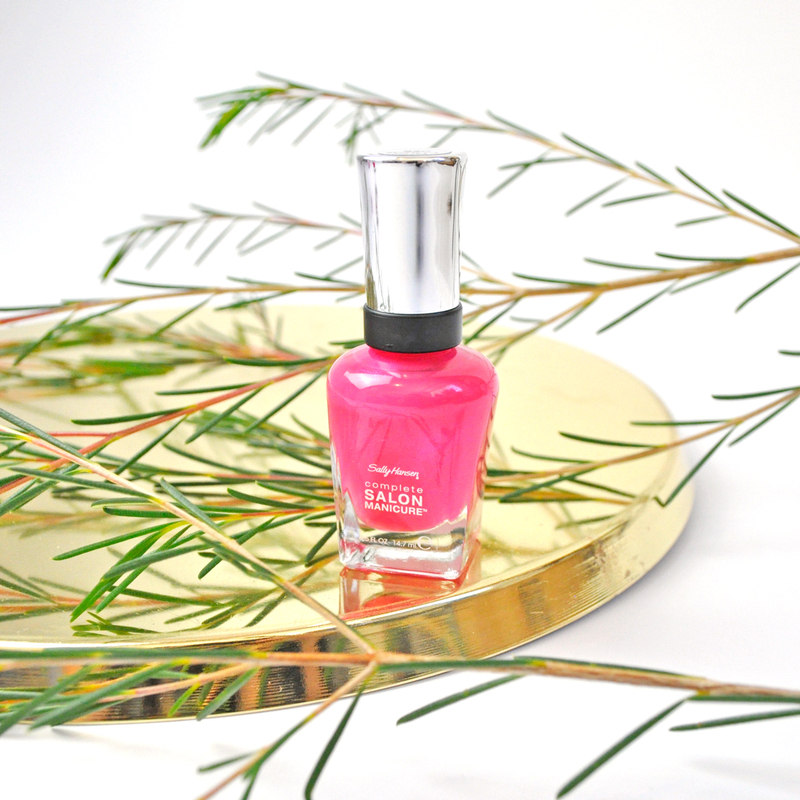 This bold and bright Fuchsia shade is the perfect color for summer, it goes with practically any outfits. Available in 27 shades. Featuring a base coat, growth treatment, runway-inspired color, top coat, gel-shine finish, chip-resistance, and a strengthener with keratin complex for up to 64% stronger nails. This all-in-one formula delivers up to 10 days of chip-resistant wear. This nail polish remover is my absolute go-to cleaning formula as it feels gentle on my nails and cuticles. I have tried other brands and find myself always going back to this trusty product because it removes all traces of nail polish so well. It’s easy to use and works effortlessly. A little goes a long way, you just need a quick dab with your cotton pad and it melts away all colours. Have you tried Sally Hansen’s nail polishes before? Which colour is your favourite? These colours are so pretty! I’m so happy they sent out the nail polish remover too, I was nearly out of it! Their nail polish removers are the best! How beautiful is pampered in pink! It’s one of my favourite shades at the moment! These shades are perfect for summer! And I love that they contain argan oil so it should be nourishing for the nails. I love that it contains Argan oil! I think so too! They are super cute. I was sent this package recently too – how beautiful are the shades? They are so stunning! I want to try more colours now. Back to the Fuchsia is such a gorgeous shade and I love the name, very punny! Lol 🙂 I love the name so much! I am loving these two shades at the moment. These are indeed so pretty pink shades, perfect for even everyday wear and for that pop of brightness. Love your pictures. I know, right 🙂 Love these two shades of pink. Same here, they are so good! I haven’t tried this line of Sally Hansen polishes yet but there are some really pretty colours in the range! Might have to pick one up… haha my ever growing nail polish collection! Cool post! 🙂 Really like it actually.